Posted on August 21, 2018 at 7:14 am. It’s that time of year again. It’s time to get out and about to enjoy some of the warm weather while it lasts. Whether you choose to spend your time relaxing in the backyard or adventuring up a mountainside on a hike, there are always things you should be on the lookout for. 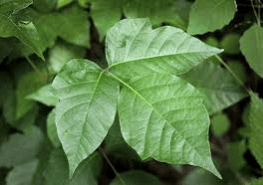 Poison ivy is a common outdoor hazard that many people encounter every year. This plant can cause problems when touched so knowing how to identify it and knowing what to do if you come in contact with the plant is key. Indirect contact- oil from the plant is transferred from another object or animal. This can be any object that has touched the plant or a pet that has the oil on their fur. Don’t worry pet lovers, animals do not get the rash. Airborne contact- burning poison ivy can release the plant’s oil into the air. The oil can then land on skin and cause a rash. If you are unsure about which products to use to treat your poison ivy rash or whether further medical attention is required, Bremo Pharmacy can help answer your questions. Our contact page is linked below. We have three locations with pharmacists that can help.